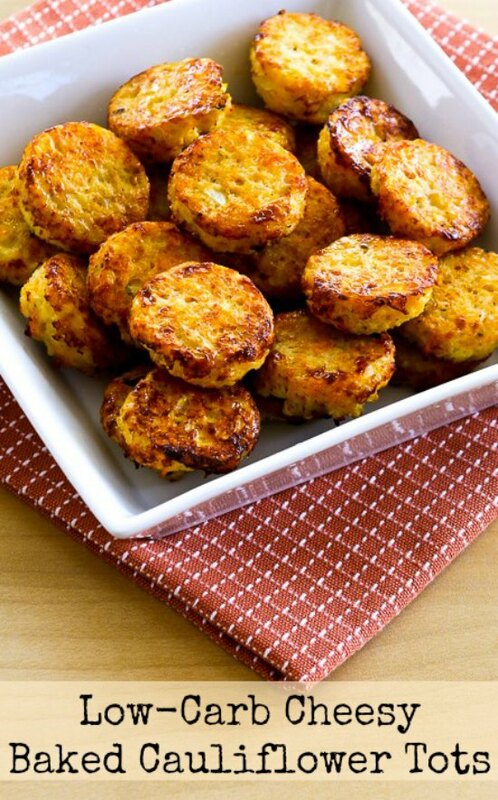 Low-Carb Cheesy Baked Cauliflower Tots are great for a bite-sized and delicious snack or side dish! This recipe is low-carb, Keto, low-glycemic, gluten-free, meatless, and South Beach Diet friendly; use the Diet-Type Index to find more recipes like this one. Click here to PIN Low-Carb Cheesy Baked Cauliflower Tots! Low-Carb Cheesy Baked Cauliflower Tots! When a food idea takes off on Pinterest, it can quickly spread around the web, and I know that’s where I first saw the idea of finely chopped cauliflower made into cauliflower “Tater-Tots.” The original deep-fried Tater-Tots are one of those foods from childhood that I kept liking way into adulthood, and I love the idea of a healthier version made from cauliflower, so the minute I saw this I knew I’d be trying it.I saw ideas for cauliflower tots that looked tasty from several other bloggers, but every recipe I found had an ingredient I didn’t want to use (like breadcrumbs, cornmeal, heavy cream, or butter) so I started experimenting to come up with my own version. It took me four tries to make what I thought was a perfect recipe for Low-Carb Cheesy Baked Cauiflower Tots, with just enough cheesy taste but still a little cauliflower flavor and slightly crisp from the oven. Along the way I had to buy a Mini Muffin Pan, and using a One Tablespoon Cookie Scoop helped me get them all the right size. Cooking the cauliflower before we chopped it in the food processor also gave a better result, and we drained the chopped cauliflower to keep the tots as crisp as we could get them. Coarsely chop up 1/2 large head of cauliflower. Put cauliflower in a bowl, cover the bowl with cling-wrap, and microwave on high for about 2 minutes. (If there’s any water in the bottom of the bowl, drain the cauliflower before you put it into the food processor.) Process the cauliflower with the steel blade in the food processor until it’s finely chopped (but be careful not to over process so it’s starting to get pureed.) It should still be slightly chunkly. Drain it again if you see any water in the bottom. Stir in the sharp cheddar, coarsely grated Parmesan, almond flour, Vege-Sal, Spike Seasoning, and black pepper and mix until it’s well-combined. Then add one egg and mix until the mixture is mostly all coated with egg. Preheat the oven to 400F/200C. Spray a Mini Muffin Pan with non-stick spray and use a One Tablespoon Cookie Scoop to scoop out rounded scoops of the mixture and put in the muffin pan. Bake for 15 minutes. Turn each tot over and put back into the oven and bake about 15 minutes on the other side. Here’s how they looked after the second 15 minutes of baking. Serve hot. Jake and I ate them all, but I doubt these would reheat that well, and they were definitely best right out of the oven. Enjoy! A great bite-sized snack or a delicious side dish! Preheat oven to 400F/200C. Spray a Mini Muffin Pan with non-stick spray. Cut away the leaves of the cauliflower, but use most of the inner core part. Quickly take off the cling-wrap and let the steam escape, and if you see any water in the bottom of the bowl, put the cauliflower into a colander and let the water drain off. If there is any water in the food processor bowl, drain the cauliflower again in the colander. Put finely chopped cauliflower into a bowl and add the reduced-fat sharp cheddar, coarsely grated Parmesan, almond flour, Vege-Sal or salt, Spike Seasoning (if using), and fresh-ground black pepper. Stir until ingredients are well-combined. Use a One Tablespoon Cookie Scoop or a steel one-tablespoon measuring spoon to scoop out rounded spoonfuls of the mixture and place it in the mini muffin pan. Carefully turn each cauliflower tot over in the muffin tin and bake 15 minutes more, or until tots are nicely browned on both sides. Serve hot; these are best served right out of the oven. We used this almond flour, as well as Vege-Sal and Spike Seasoning. This recipe developed by Kalyn with inspiration from several other bloggers who also made Cauliflower Tots. Low-Carb Cheesy Baked Cauliflower Tots are great for most low-carb diet plans, including Keto. 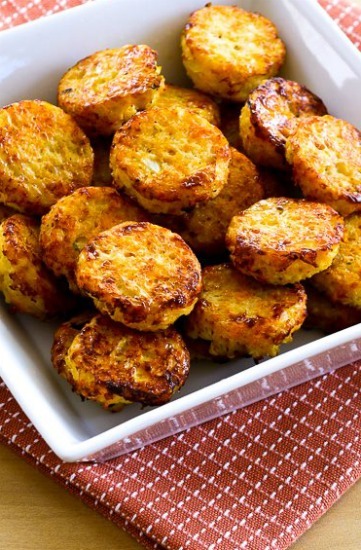 Cauliflower is also a perfect low-glycemic food for the South Beach Diet, and with the use of reduced-fat cheese these Cauliflower Tots would be a perfect snack or side dish for any phase of the diet. Use full-fat cheese for Keto or low-carb diets. Calculated all the nutrition for yall..
Wow so easy and they look amazing. Thank you, will try. Yum! These cauli tots turn out perfectly everytime I make them! Glad you have enjoyed them! Cauliflower tots Takes longer to prep and don’t use muffin pan. Good flavor. Used mrs dash because did not have veggie sal. Turned out well. Have made twice. Added slightly more spice 2nd time around. Feel free to adapt any way that works for you. Glad you’re enjoying it! Looks like I need to go shopping for a mini muffin pan. Looks amazing! Can’t wait to try this one. 1/2 a head is how many cups? I didn’t measure it that way, sorry. When I asked Google “how many cups chopped cauliflower in a head of cauliflower” it said 3-4 cups, and looking at my photos it looks like about 2 cups to me, but that’s the closest I can tell you. I don’t think it has to be an exact measurement. Wow…I REALLY wanted these to work. Pretty much, they’re a mess. I think my scoop is a tablespoon and a half, though. I think maybe I should have rubbed butter into my mini cupcake pan. I think I should have squeezed the cauliflower. I’ll try them again, but MAN, I wanted them to work out. (they didn’t) They stuck, and were pretty wet, and I think, too big. Yes, definitely you need something like nonstick spray or butter to keep them from sticking. I don’t think larger amounts will work either, and they cauliflower can’t be wet or they’ll just be soggy. I hope you do try again. Read through the comments to see things that helped other people. These look just so yummy! Am on the road but I’ll try this when I get home (in a couple of months-LOL!). I love cauliflower, anyway, but this recipe would be a real treat! Oh, and both my husband and I looooooovvve them! Wonderful even cold. Thank you! So glad you enjoyed! I am intrigued by your ingredients! I used frozen bagged cauliflower sweet potato. Opened bag, microwaved 3 minutes. Expected to drain but nothing. Fine chop 1/2 onion. Seasoned with salt, pepper. Otherwise the same. Used ice cream scoop (light). Worked great in heavy nonstick muffin tin. SMall muffin tin did not cook well and stuck. Can these be frozen in batches and then popped in oven from frozen to reheat? Would be great to make in large batches for sides for lunches or dinner. I’m guessing they would freeze well, since the cauliflower is slightly pre-cooked but I haven’t actually tried it. Would love to hear how it works if you try it! Help! I was actually looking for your zucchini tots recipe, but it looks almost the same. Is that right? Actually I don't have a recipe for Zucchini Tots. You might be thinking of the blog Skinnytaste; I know she has one that's good. Love that idea; so glad you liked them! Has anyone tried freezing them and had them be okay? I haven't done it, but I am guessing the cooked ones would freeze pretty well. I would put something like waxed paper between them if you make more than one layer. Let me know how it works, would love to hear! So glad! I love the idea of using frozen cauliflower! Susan, did you use the entire Trader Joe’s bag of cauliflower rice for this recipe? Thank you, Susan! Not sure she will see the comment, but I am guessing a bag of cauliflower rice is more than 1/2 a head of chopped cauliflower. Hi, about how much cauliflower did it make after putting it through the food processor? Would you say about 2 cups? I wish I had measured that, will try to remember to do it when I make them again. The bowl pictured is quite large; I'd say it's closer to 3 cups but not completely sure. Hi there! I tried your recipe today and the kids and I really enjoyed it! Also — I skipped the microwave step and went right to "ricing" the cauliflower. Everything turned out beautifully and it had a nice texture, very similar to standard tots. I used a bit of olive oil quickly brushed into each muffin compartment and had no sticking whatsoever. Also, I don't happen to have a mini muffin tin so I used a regular — gently tamped down the tots to about 1/3 full in each muffin hole, and it made exactly 12! I stuck to your timing (15 min each side). Turning them was easy once I got the hang of it; a regular spoon worked well to help me get enough leverage to flip them. Great recipe – thanks! Interesting; now I want to try it that way! I made these this morning.. Wow are they delicious! It was minutes and they were all eaten. Our 8 year old scarfed them down! Thanks for sharing great recipes. This is totally on my Superbowl menu! Thanks Janice; hope you enjoy! Could they be made ahead and baked later. I am guessing yes, but I haven't done it so I can't say for sure. If you kept them in the fridge, you'd probably need to let them come to room temperature before you cook or the baking time will be way off. I followed the directions to a T on this recipe and the tots never crisped up and didn't even want to come out of the tin. very frustrating as this was the main side dish for our dinner and I'm on a lo-carb diet. Sorry to hear they didn't work for you. As you can see from the comments, many other people besides me have made them successfully, so I'm not sure what happened. Maybe the temperature of your oven or the kind of metal your pan was made of might be a factor? My mini muffin tin was in the sink, so just put them on a foil lined cookie sheet. The mix was a little hard to work with as I don't have a cookie scoop. Sprayed my TBSP with Pam and they just dropped right out when turned over. They came out sooo good. Some salt and a little ketchup on each. The taste is awesome…tasted almost like a raw potato when grated for hash browns. Nice crunch to the outside. These are definitely going to be a staple in my house! So glad you enjoyed them Jill! If you want lower carbs use full fat cheese. Low fat foods are not good for you!If it says low fat or no fat don't eat it! Can I use frozen cauliflower for this? And if so, how much would I use? These look so good. Sorry but I haven't made it with frozen cauliflower so I don't know how it would work or how much to use. You might look through the comments and see if anyone else has tried it. I made these today and they are insanely delicious! I put some raw almonds in my blender to grind to a fine powder since I did not have 'almond flour' at home and it turned out perfect. After one batch was done it was so wonderful I immediately made another batch. My husband will not eat caulflower at all so I did not tell him this was a caulflower recipe and he RAVED about it and wanted MORE! We are on a low carb, low calorie diet and this is THE BEST snack recipe we have tried. I will be making it for guests, parties and just for snacks around the house. Thank You!!! Could you please post the nutritional values? For a variety of reasons (including the fact that it's very hard to accurately calculate serving sizes and I already spend 8-10 hours on every recipe) that's something I'm not planning to do, But if you look after the recipe there's a link where you can enter the recipe and calculate it yourself. Epic fail! They all stuck to my pan and I had sprayed it well with coconut oil spray. Very sad! Hard to know on this if it was that or your pan, but they did work for me and also for other people, as you can see from the comments. Kalyn…found this recipe on Pinterest and it looks great! I was just wondering how cooked the cauliflower gets in the microwave and if you could use another cooking method like steaming? I don't typically like to use the microwave if I can avoid it. Thanks so much in advance and I am hoping that I can get my kiddos to eat this one! The cauliflower is still a bit chewy after you microwave because it will get more cooked when the tots are baked. I don't know how much time that will take but I'm sure steaming will work. Be sure to drain it well after you steam. Hope the kids like them! I haven't tested with other flours, so I can't say for sure how they will work. But I used almond flour to keep it low-carb. If that's not an issue for you, I'd just use a little regular flour. Something like quinoa flour would probably work too. Kathleen, good to know, thanks! I made these over the weekend and we loved them! I stayed true to the original recipe with 2 exceptions: first, I substituted Italian seasoning for the Spike seasoning and second, I baked them on a parchment-lined baking sheet, since we're between houses and I don't have my mini muffin tins with me. Both changes worked well–shaping the tots and putting them on a baking sheet definitely added a little up-front time, but they were very easy to flip over, so it probably makes up for it there. I also saw someone asking if these freeze well and I can say that yes, they do! The texture changes a bit (I guess you'd say they're a bit more rubbery, but not to the point where they're unappetizing), but they're still just as tasty. I heat them on a baking sheet for 10 minutes at 350ºF. Thanks for all the info and your report on what worked for you. I'd have to make a double batch in order to have any to freeze! Hi Kalyn, love, love, love your website – I've been reading for couple of years now and you never disappoint. I really want to try these cauliflower tots but I only have a six-muffin pan (for regular sized muffins) Can I put the tot mixture into those—will the baking time increase? sorry if this is a silly question – i'm still a bit of a novice! Hi Sarah; glad you are enjoying the site! I am honestly not sure how it would work to cook the mixture in larger muffin pans. For sure they'd take longer to cook because the mixture would be thicker. But what makes these good is the way they're browned so well on both sides, and the thick pieces might not have that quality. Maybe worth a try though. Or maybe try cooking them as small loose tots, smashed down a bit, on a cookie sheet. Let me know if you find a way that works.